Leonardo San Roman currently serves as the Acting Manager for the DOT Office of Small and Disadvantaged Business Utilization’s Procurement Assistance Division. In this capacity, Mr. San Roman is responsible for ensuring the Department of Transportation's compliance with Federal statutes and initiatives as they relate to small business development and other disadvantaged groups. Prior to joining DOT, Mr. San Roman served as Project Manager for the Plans, Policy, and Resources Directorate with the Naval Audit Service. Previously he served as the Finance Director for the Senate of Puerto Rico. 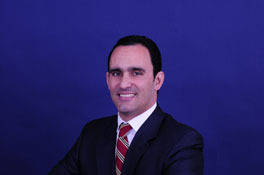 He has also served as the Deputy Director for Administration, Budget and Finance for the Office of the Governor of Puerto Rico at the Puerto Rico Federal Affairs Administration in Washington, D.C.
Mr. San Roman earned a Bachelor’s degree in Physics from the University of Puerto Rico, Mayaguez Campus, and obtained a Masters in Business Administration from the University of Phoenix.